Color Dust allows you to change the color of flowers you’ve already grown. To use Color Dust, first plant some seeds and grow the flowers. Then press the “plant enhancements” button on the top left. You’ll get a screen like this giving you the option to apply Fertilizer or Color Dust. 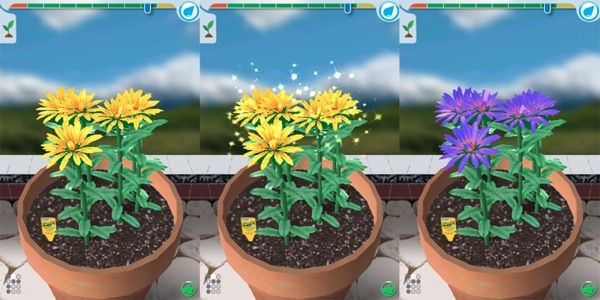 Press the Color Dust button, and watch the flowers change into a random color. You can apply Color Dust as many times as you want to find different surprising colors. 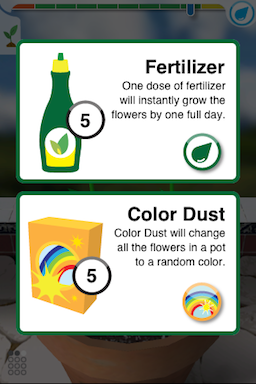 If you run out of Color Dust, you can earn more by redeeming Credits that you earn through Green Thumb Points, or you can purchase Color Dust directly from the Flower Shop.